ANC EARLY COLLEGE PROGRAM :. ANC is partnering with area school districts to offer an early college credit program. In doing so, many local high school students can earn college credit while still in high school. This early college enrollment program will increase students' opportunities to gain early college credit at a reduced tuition rate. This will save students both time and money to be spent on their college education. Concurrent credit classes are offered to students in general education courses through classes on the college campus or online. Students must meet all college placement score requirements for enrollment into college credit courses. Once accepted into a college course, students must complete the orientation tutorial E-Racer to learn how to use the ANC online student learning management portal. College instructors will use this portal to communicate with students regarding class assignments and activities, to post grades, and announcements. Students will also have access to all ANC online library resources. Students will work with the ANC Career Coach or high school counselor to complete an ANC application packet. This packet will include a College Admission Form, ACT or COMPASS scores, a Registration Form, and a Parent/Student Authorization Form. 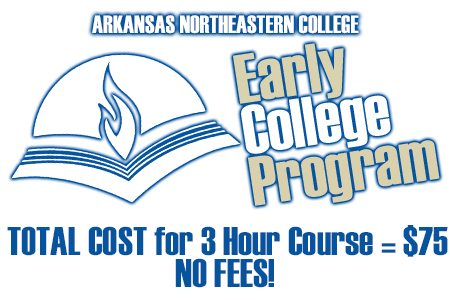 Costs for early college credit courses are $25 per credit hour ($75 per three-hour course). Additionally, there may be a cost for textbooks and/or access codes for online materials used in the college course. This amount can range from $75 to $150 per course. Many books are available for a rental free, and purchased books can be bought back by the Bookstore at the end of the course. Payment guidelines for all tuition, books, and fees will be determined by your high school, and are available from the counselor or Career Coach. Credit attempted and earned through this program will be posted to a college transcript and become a part of the student's permanent academic and financial aid record. Therefore, the grades earned, as well as credit attempted and earned, will be included in all college grade point averages and completion rates to determine satisfactory progress for both academic and financial aid calculations. ANC's Early College Scholarship is offered to students enrolled in all Mississippi, Greene, and Craighead County high schools (including Buffalo Island Central) and Missouri Bootheel high schools. It provides a net tuition/fee cost of $25 per credit hour for up to six hours of concurrent credit per semester for students. The Early College Scholarship applies to live general education offerings delivered to local high schools, and online or live courses taken independently by county high school students while enrolled. The Arkansas Northeastern College Technical Center is a workforce education center that offers both high school and college credit in career and technical programs to all high school students in Mississippi County, Arkansas. The Technical Center is housed in the new ANC Center for Allied Technologies in Blytheville, and provides students with hands-on training in career and technical fields. Our programs of study teach marketable job skills and offer industry certifications, as well as college credit towards Certificates of Proficiency, Technical Certificates, or an Associate's Degree from ANC. Services are offered at NO COST to the students. Books, tuition and fees are provided through the Center and funded by the local school districts and the Arkansas Department of Career Education. Arkansas Northeastern College Career Coaches work in the Mississippi County high schools with students in grades 8-12 to encourage them to continue their education at the post-secondary level. Their services are offered at NO COST TO THE STUDENT. The purpose of the Career Coach program is to extend the career guidance services for students moving from high school into post-secondary education. Extended guidance services can prepare students for a more successful college experience and career by helping them set and achieve realistic goals and develop the knowledge and skills they will need to succeed. What are the benefits of Career & Technical Education? Career and technical education can benefit students directly by providing earning advantages before and after graduation. CTE programs motivate students to get involved in their learning by engaging them in problem-solving activities. These programs provide hands-on activities that enable students to apply knowledge and learn skills for the workforce. Career and Technical Education helps students make the connection between learning and the real world, helping them answer three key questions: What am I learning? Why am I learning it? How am I going to use it? What subject areas are covered by career and technical education? CTE covers a variety of challenging fields in diverse subject areas that are constantly evolving due to the changing global economy. Yes, according to many studies, CTE graduates are 10% to 15% more likely to be employed, and earn between 8% and 9% more than graduates of academic programs. What is Concurrent Enrollment, and why is it appropriate for CTE students? Concurrent enrollment programs are collaborative efforts between high schools and colleges in which high school students are permitted to enroll in college courses. These programs provide students with a challenging academic experience and the opportunity to earn college credit prior to high school graduation. Is CTE only for high school students who are not college bound? NO. CTE can provide a foundation of skills that enables high school graduates to be gainfully employed either full-time or while in college. Nearly two-thirds of all high school graduates of CTE programs enter college. Rigorous academic content tied to technical subject matter ensures that these students will be ready for college. The internships and other cooperative work experiences that are a hallmark of CTE are attractive to all students who want to get a head start on a career, whether that career goal is doctor or nurse or computer scientist. Student organizations also help students acquire the employability and leadership skills that will enable them to succeed in the workplace. CTE links high school and community college curricula to help students make a smooth transition to college and careers.